What kind of a company do you have? What size is your company or workplace? Are you manufacturing or maybe not? Regardless the size of your company and the line of business you are in; if you are operating or manufacturing light or heavy machinery even running a print shop; you need equipment manuals, warnings, instructions, permits, licenses and displays. Using these equipment s, posting warnings, hanging user manuals besides the work stations or frequently sending advises about the machinery would be costly, time taking and a tedious full time job. And did you ever think, are they reaching your target people? Is the staff actually taking time to read the papers? Do you check on your operators to make sure , they are fully aware of the facts about the equipment s, machinery? You may own or lease valuable machinery. Do the operators use them to correctly, making sure it used to its full capacity? Is it easy for your staff to reach information? Or do you have data that you need to hide from public eye but easy to reach by the operators. With Augmented Reality supported instructions you can create your own Smart environment. You can easily publish data across platforms for Android ans iOS. We are proud to introduce and bring you the mix reality environment for your work place with cxocARd. You can readily use the AR technology for all devices on the market. Furthermore, it simplifies the process of managing data in a plant. You can easily and readily bring Technical Data Sheets alive for a worker, staff on the floor. Your data would be available to people you choose to display the TDS. You can simply attach a plaque or attach a card on your equipment. When the plaque or the card is scanned by the cxocARd application on your mobile phone the video content you have previously provided will be visible on the mobile environment. Moreover, your data will be securely saved on our servers. CxocARd allows the users with no coding knowledge to create rich, live augmented reality instructions that automatically displays data, provide actionable insights, and can be deployed globally through a simple application. We do it by transforming traditional paper based instructions into animated, 3D videos that will display on the top of the real world. 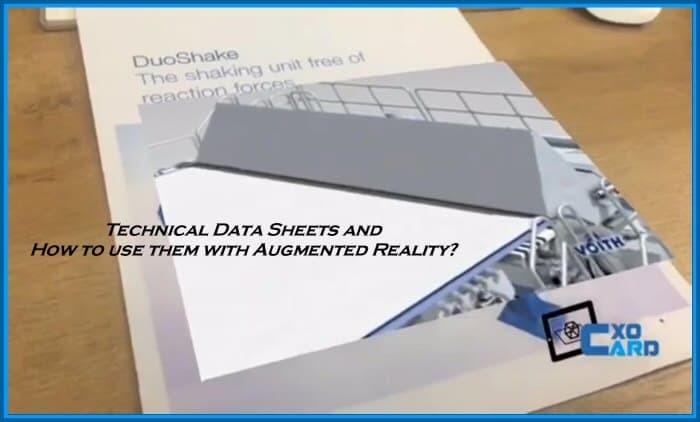 The following is link displays a video about Augmented Reality enhanced Technical Data Sheets. The integration of AR technology and the Technical Data Sheets creates a better understanding of the apparatuses which results in higher quality, cost and time saving operation that will take your company to an upper level. Also, statistically, people show more interest in AR supported texts. It means your employees will be more likely to be more engaged on the augmented reality displays on their mobile phones.